Sussex Building Consultancy is a small general building advisory practice specialising in the Building Regulation aspect of development. Whilst the company has been trading since 2003, the proprietor, Chris Moore has been in the building industry since 1983, 20 of those years spent in Building Control. The company aim is to make your building experience as effortless as possible. 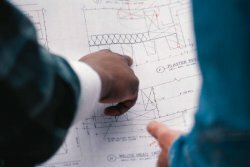 We can take on your project from conception and design, through the applications for planning and Building Regulation permission, and on to construction process on site. The busy practice has a large, mostly residential customer base from individual householders with domestic extensions and conversions to developers dealing with new build or conversion flat and housing projects. With the increasing complexity and ever changing requirements of the current Building Regulations we are becoming more involved in regulation consultancy, offering a service to developers and other Architectural practices being able to shepherd a development through the various Building Regulation issues. With close and established links with local authorities we can provide an often much needed bridge between designer and the enforcing authorities. We are proud of our flexible approach and understanding of our customer's needs, providing all expertise from inception to final completion of the work. Where required we have close links with other experts in the field of planning consultancy, structural engineering, fire risk assessment, thermal appraisal and calculation, sound testing and design, access statements and air pressure testing and design. I thank you for your time and if you require, look forward to discussing your building needs.